I have been making stuffed critters since I was about 15 years old. I still have the first stuffed critter I made - a pillow dog made from a baby blue flannel with little blue flowers on it. It has survived many moves and a river's worth of tears. I recently found the pattern for him. I may have to make another one because it is just so darn cute! It wasn't until after I'd graduated from high school and moved out on my own that I started making teddy bears. The first bear I ever made was from a McCall's pattern. There were four sizes of bear and a bunch of outfits to make for them. I didn't have a sewing machine handy so I started hand sewing the eight-inch cutie. Except for the fact that he has no nose or mouth, I think he came out pretty good for a first attempt. From there I tried bigger bears. I think the biggest was 18-inches. It was hand-sewn with long fur. He went to my great aunt, who I happened to be living with at the time. I tried some fabric bears but didn't really like them so I went back to the furry ones. Some sock monsters I created. An adorable octopus I created. Over the years I have made koala puppets, teddy bears of all sizes and colors. I've also created a skunk, some rabbits and at least one lamb. I've crocheted them as well as cross-stitching a few here and there. I have sold a few of my bears but most of them have been either given as gifts or for my daughter. The last bear I made was for my (now ex-) boyfriend for our first Valentine's Day in 2002. 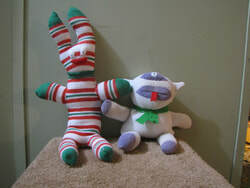 I've even made a few monsters from socks (shown above)! I love to crochet critters, and almost always use my own designs. The one thing that has eluded me for years is being able to make my own bear pattern for a fur bear (crochet ones are much easier!). I have created dozens of bears and modified the patterns to fit what I wanted but no matter how I try I just don't seem to be able to create my own bear pattern. I can create Halloween costumes from out of my head, draw, sew just about anything but still no bear pattern. It is so frustrating! Any advice on how to overcome this?